When Sarah Palin's email account was hacked a few years ago, the hacker used social engineering, not technical prowess. By pretending to be Palin and requesting a password reset, the hacker answered the security questions by using publicly available knowledge about Palin. You know those security questions on many sites: various questions like home town, school mascot, dog's name, first car, and so on. You may not be as famous (or infamous) as Sarah Palin, but your accounts can be hacked via security questions as well. Take a look at your friends on Facebook and notice how much information used for security questions are in their profiles. The answer? Don't play their game, play yours. There is NEVER a good reason to put your CORRECT personal information on Facebook or anywhere else on the Internet. Next time you see a set of security questions, use the same answer over and over and over. For instance, as a musician, I may use Beethoven for every answer. And I mean EVERY answer. 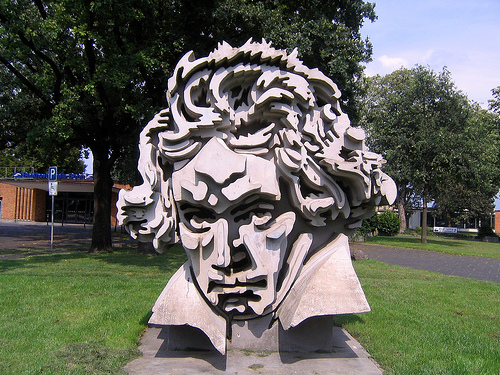 Historical figure you'd most like to meet: Beethoven. See, those make sense.Sometimes your chosen word will. Other times? Nonsense. Pick a word, name, place, or made-up word (not your password) that you can always remember. Use it for every entry on all your websites that demand security questions. After the change, no one will ever guess your security hints. PS: The Tyler Writer's Workshop & Conference starts in two days. Here's where you SIGN UP. When family members try to use my computer, they complain about the ergonomic keyboard and trackball. Mostly they complain about the trackball because it's on the wrong side of the keyboard. Why? Because several years ago when I was pushing hard to make a book deadline, my fingers and arms started tingling. My solution? Get an ergonomic keyboard (Logitech New Touch) and trackball (Logitech Marble Mouse). Unfortunately, the keyboard is no longer made, so when it dies I will be forced to buy one from eBay. Note: the toys in front of the monitor are from my daughter. She loves to give me such gifts and I love getting them. The huge monitor is an Acer B326HUL, a 32 inch monitor with a resolution of 2560 x 1440, far bigger than the standard size of 1920 x 1080. Sad to say it's an evaluation model for a review, and I'll have to give it back soon. The other change that drives people crazy is using a trackball that's on the left of the keyboard rather than the right. Why do I put it there? Distance. Take a look at your keyboard. How far is it from the middle of the keyboard to the right edge? Go ahead and measure, I'll wait. Now how far from the center of the keyboard tot he left edge? Usually only a quarter of the distance. When you move your right arm waaaay over to the mouse, then move the mouse right and left and forward and back, you put a lot of strain on your right elbow and wrist. The only thing worse would bu using the track pad built into the Logitech keyboard, which requires you to move your elbow to the right and back towards you, putting stress on your elbow and shoulder. That's stupid, so I never try to use the track pad. With my trackball on the left, I move only a few inches to manipulate the cursor. My index finger falls naturally on the trackball, leaving my second finger on the left mouse button, the most used. You will struggle a bit with the trackball on the left, but after a day or two you'll be swooshing the cursor around the screen like a pro. After my new keyboard and trackball became standard, I never had another tingle in either hand. Was I headed toward carpal tunnel problems? Maybe. Do I worry about that at all now? Absolutely not. Take any tingling in your fingers, hands, wrists, or elbows as a serious warning, and make some changes immediately. Plus, other people will stay off your computer.